^ "Trump: 'President Xi is a world-class poker player'". BBC. 2018-05-22. Retrieved 2018-05-25. ^ Taipei Economic and Cultural Representative Office in the U.S.
Eckholm, Erik. 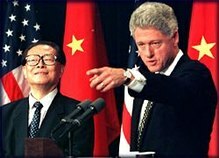 "Clinton Urged to Meet Top China Dissident." New York Times 20 June 1998: A3. Historical New York Times. Proquest. DuBois Library, UMASS Amherst. 10 Apr. 2006.